Bed bugs. While nobody likes to think about an uncomfortable infestation, the city of Denver was rated as the fifth most bed bug-infested location in the country. The influx of travelers into our beautiful state has made the invasion of these pests a major problem for hotels, apartments, healthcare facilities, and more. While the thought of dealing with a bed bug infestation may cause your skin to crawl, it is essential to check for an infestation if you notice some of the common symptoms. Home and business owners across Colorado have a range of techniques to choose from, including the use of a bed bug canine from Advanced K9 Bed Bug Seekers. 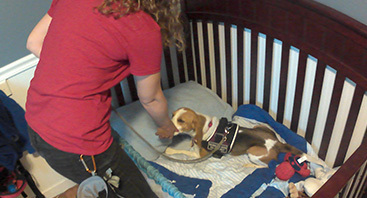 As the name implies, our bed bug inspection specialists rely on the sure smell and instincts of our dog Tracker. 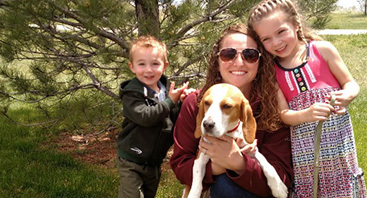 This Beagle is a talented canine trained in California by Stephanie Taunton to provide accurate bed bug inspection results for your property! While we are proud of the accuracy of our bed bug K9 services, it’s important to remember that there are other methods available to check for an infestation. Learn more below before contacting our team for complete bed bug identification! These traps can capture bed bugs as they move about your space, placing these pests in a sticky situation for easy identification. Both glue and pitfall traps are considered interception devices, relying on attractants and inescapable designs to lure in unsuspecting bugs. Adhesive traps are often the most affordable, but may not yield accurate results. Be sure you plan for a week or more of waiting to see if any bed bugs turn up. Relying on humans as the bait to attract bugs into a trapped situation, pitfall options often rely on a textured exterior and smooth interior surfaces to allow bed bugs in but not out. By placing a pitfall device next to the leg of your bed, you can expect to trap a number of insects trying to make their way onto your mattress for the evening feeding. Placing these traps under furniture can yield some revealing results, but keep in mind that you may still need an expert for confirmation. In order to attract bed bugs into the traps your detection specialists have set out, certain chemicals will need to be used for the best results. Pitfall and glue traps may rely on CO2 and a source of warmth to attract bed bugs, while chemicals act as a powerful pheromone. Bed bugs rely on different chemicals to communicate to one another, making the use of pheromones in trapping them a smart choice. Before you give up hope on detecting bed bugs in your Denver home or business, keep in mind that services such as K9 bed bug detection can deliver considerable peace of mind. Advanced K9 Bed Bug Seekers is here to deliver as our name promises, relying on our highly trained dog Tracker to find bed bugs throughout your property. Our good boy will seek out the unique scent of bed bugs and alert us to any areas of interest. While other methods of bed bug detection can be useful for finding an infestation, an inspection by our bed bug canine will truly help to find hidden evidence. Contact us today to see why we’re Denver’s trusted bed bug dog specialists, and be sure to a schedule your appointment with our team of experts!